Comments: Braunite II was first discovered in 1945 at Black Rock and described as ferrianbraunite. The phase was renamed braunite II by De Villiers and Herbstein in 1967 and its crystal structure was determined by De Villiers in 1980. 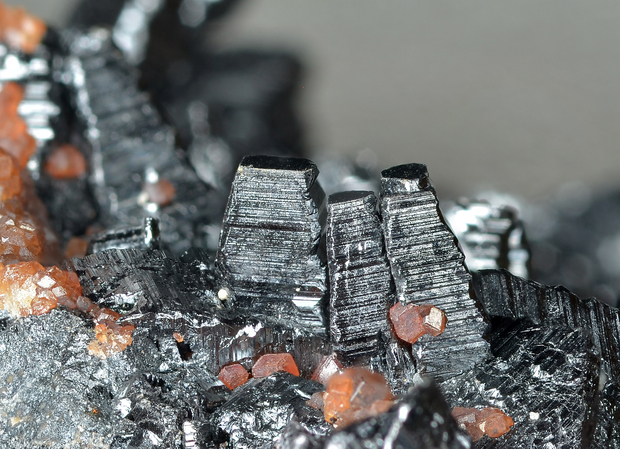 Metallic-grey braunite II crystals have come from Wessels, Black Rock (up to two centimetres) and N’Chwaning II. 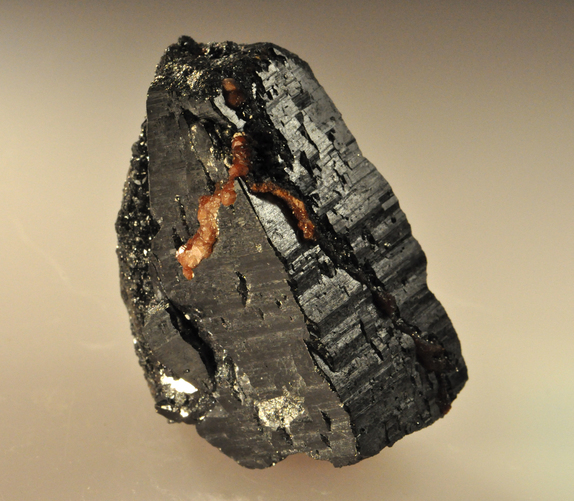 The crystals are typically bipyramidal with complex terminations. In 1995, crystals up to three centimetres were found at Wessels mine, and a few very rare larger crystals were also collected at the time. 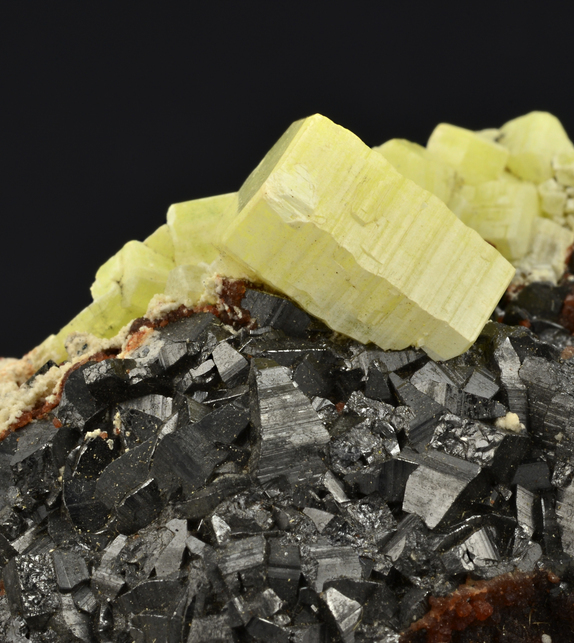 These were associated with andradite garnet, hausmannite and occasionally yellow ettringite. Braunite II is not listed as a recognised species in the IMA RRUFF database. See De Villiers (1945), De Villiers and Herbstein (1967), De Villiers (1970), De Villiers (1980) and De Villiers (1989) for details. References: De Villiers, J.E. (1945b). Some minerals occurring in South African manganese deposits. Transactions of the Geological Society of South Africa, 48, 17–25. De Villiers, P.R. and Herbstein, F.H. (1967). Distinction between two members of the braunite group. American Mineralogist, 52, 20–30. De Villiers, P.R. (1970). The geology and mineralogy of the Kalahari manganese-field north of Sishen, Cape Province. Memoir of the Geological Survey of South Africa, No. 59, 84 pages. De Villiers, J.P.R. (1980). The crystal structure of braunite II and its relation to bixbyite and braunite. American Mineralogist, 65, 756–765. De Villiers, J.P.R. (1989). 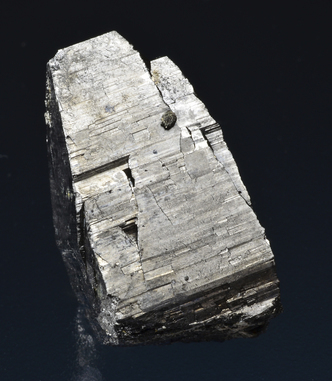 Stacking variations and nonstoichiometry in the bixbyite-braunite polysomatic mineral group. American Mineralogist, 74, 1325–1336. Cairncross, B., Beukes, N. and Gutzmer, J. (1997): The manganese adventure – the South African manganese fields. Associated Ore & Metal Corporation Limited, Johannesburg, Republic of South Africa, 236 pp. Cairncross, B. and Beukes, N.J. (2013). The Kalahari Manganese Field: the adventure continues. Struik Nature, Cape Town, South Africa, 384 pages.